DataKeeper Cluster Edition requires a unique license for each server. The license is a run-time license which means that you can install it without the license, but the license must be installed before you can successfully start and run DataKeeper Cluster Edition. The final screen of the InstallShield installation utility displays the Host ID of your server. The Host ID, along with the Entitlement ID (Authorization Code) that was provided with your DataKeeper Cluster Edition software, is used to obtain the license required to run DataKeeper Cluster Edition. The process is illustrated below. Ensure you have your DataKeeper Cluster Edition Entitlement ID (Authorization Code). You should have received an email with your software containing the Entitlement ID needed to obtain the license. 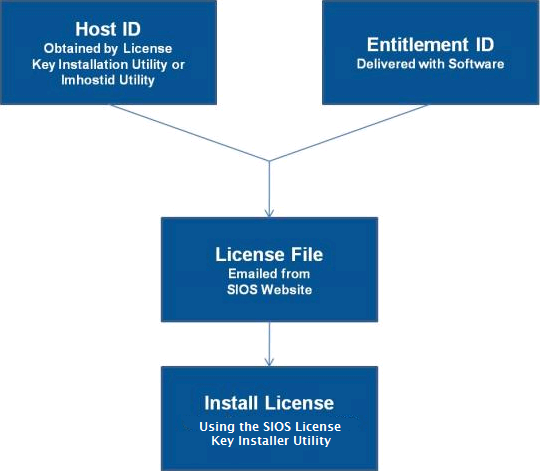 Run the License Key Installer from the Start-Programs menu (Start-All Programs-SIOS-DataKeeper-License Key Installer). Repeat on all additional servers. You must install a license on the other DataKeeper Cluster Edition server(s) using the unique Host ID for each server.